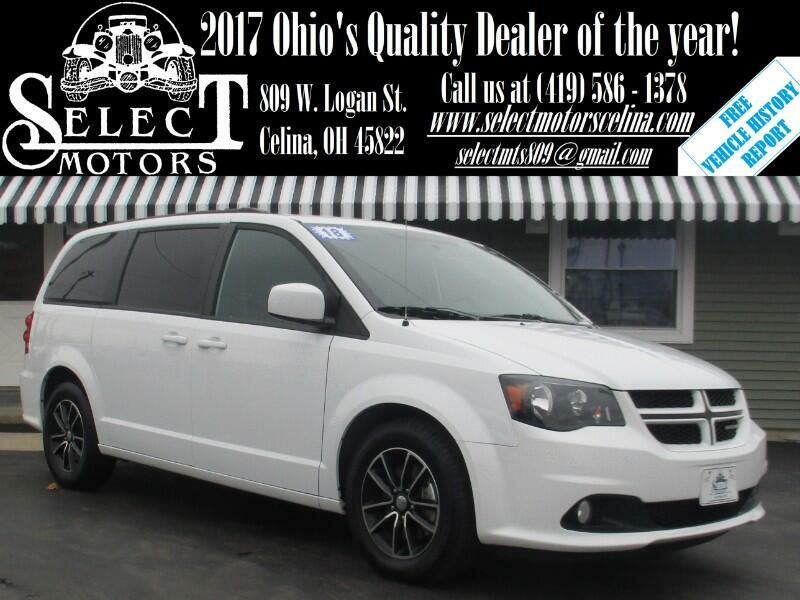 ***TXT US @: (419) 362 - 6200*** Navigation, heated leather seats, heated steering wheel, power lift gate, dual power seats with power lumbar, backup camera, keyless entry with remote start, automatic headlights, fog lights, automatic dimming mirror, Home Link, heated mirrors, dual automatic climate control, power windows/locks/mirrors, AM/FM, SiriusXM, auxiliary and USB port, steering wheel mounted audio controls, Bluetooth, tilt and telescopic steering wheel, cruise control, information center, 17" alloy wheels. Warranties: Balance of 3 years or 36,000 mile bumper to bumper and 5 year or 60,000 mile powertrain. In service date: 01/25/2018. Extended service contracts available. The budget-friendly, seven-passenger Dodge Grand Caravan is sold in four trim levels: SE, SE Plus, SXT and GT. All Grand Caravans have a 3.6-liter V6 (283 horsepower, 260 pound-feet of torque) paired to a six-speed automatic transmission. The SE's standard features list includes 17-inch steel wheels, heated mirrors, remote locking and unlocking, tri-zone climate control (with rear air-conditioning), cruise control, rearview camera, a tilt-and-telescoping steering wheel with audio controls, a conversation mirror, a second-row bench seat and full power accessories. Entertainment comes in the form of a six-speaker audio system with a CD player and an auxiliary audio jack, controlled via a 6.5-inch touchscreen display. The SE can be ordered with the Uconnect Hands-Free Group package, which adds an auto-dimming rearview mirror, a leather-wrapped steering wheel and shifter, satellite radio, a USB port, and Bluetooth audio and phone connectivity. Second-row captain's chairs are an optional upgrade and offer the Stow 'n Go fold-into-the-floor feature. The SE Plus comes with the above equipment as standard (including the captain's chairs), plus 17-inch alloy wheels, automatic headlights, foglights, black exterior styling elements, remote engine start, a front floor console and upgraded upholstery and trim. The Grand Caravan SXT added features such as chrome exterior trim, roof rails, power-sliding rear doors, a power liftgate, a larger floor console, leather upholstery with suede inserts, and an eight-way power driver seat (with two-way power lumbar adjustment). The SXT offers two notable options packages. The Blacktop package retains the SE's black exterior trim and deletes the roof rack, while the considerably more feature-rich Driver Convenience Group package adds a rear overhead console, an overhead storage bin, automatic climate control, a heated steering wheel, heated front seats, ambient lighting, and second- and third-row sunshades. The range-topping Grand Caravan is the GT. It takes the standard content from the SXT with the Driver Convenience Group (minus the chrome and roof rails) and adds a body-colored grille, a performance-tuned suspension, different wheels, black interior accents, a driver information center, a 115-volt household-style outlet, full leather seating, an eight-way power passenger seat, heated second-row seats, navigation, voice controls and an upgraded nine-speaker audio system. Different trims also get access to special options packages. All models can be ordered with a rear-seat entertainment system, which bundles the GT's touchscreen with a 9-inch overhead display screen, an HDMI input, satellite radio, two USB charging ports and a 115-volt power outlet.